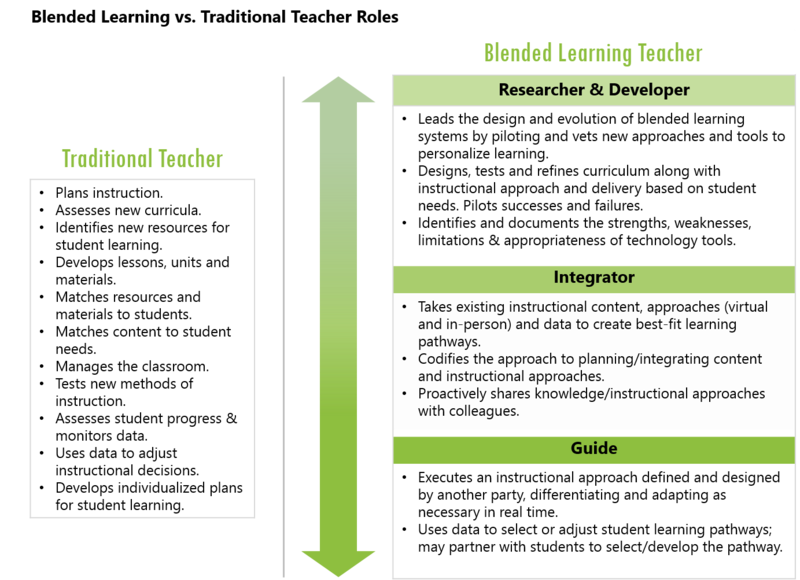 Put together, these three groups of tasks, which we can break into distinct roles, paint a more complete picture of what it takes for an educator to implement blended learning. The working paper offers leaders actionable ideas and tools to start articulating how staff will work together in blended learning schools. In the spring of 2013, TLA invested in TNTP, a national nonprofit committed to ending the injustice of educational inequity, to develop guidance to help districts and schools rethink their human capital systems to support blended learning. The organization released its findings as a working paper in November 2014. This paper, “Reimagining Teaching In a Blended Classroom,” and its accompanying tools were informed by visits to schools across the country and interviews with more than 60 practitioners and experts on the ground as well as TNTP’s work since 1997 helping school districts across the United States address their most challenging talent needs.